Bok choy, also known as pak choi, is a member of the cabbage family that is frequently used in Asian recipes, especially stir fry. 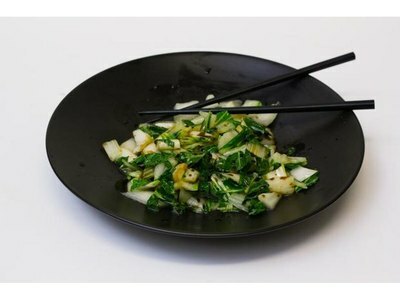 Bok choy can also be a delicious and healthy side dish on its own with a few light seasonings. It can be boiled, steamed or grilled, but stir- frying is the most common cooking technique for this vegetable. According to Gourmet Sleuth, a 100 gram serving of cooked bok choy contains a mere 13 calories, with 1 gram of fiber and 2 grams of protein. See the Resources section below for a link. Remove the bottom of the bok choy plant with a sharp knife so that the leaves separate. Rinse each leaf with cool water and pat dry with paper towels. Cut the stems away from the leaves and chop the stems and leaves into small, bite-sized pieces. Keep the leaves and stems separate because the stems will need to be cooked first due to their longer cooking time. Heat 2 tbsps. 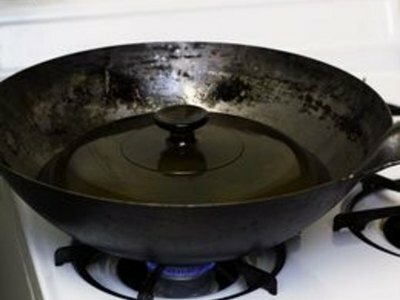 of vegetable or peanut oil in a skillet or wok over medium heat. 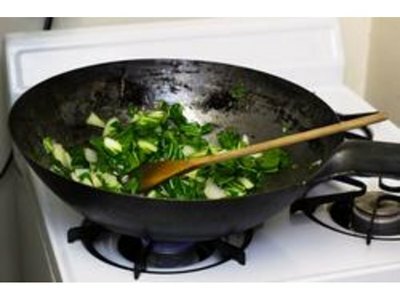 Add the bok choy stems into the skillet when the oil is hot and stir fry with a spoon or tongs for three minutes. Add the leaves to the stems in the skillet and cook for an additional three minutes, stirring often. Sprinkle 2 tbsp. 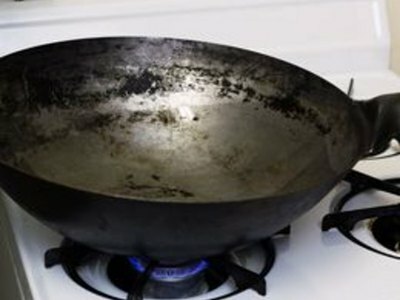 of water into the skillet or wok and cover. Let the bok choy steam for approximately one minute and then remove from heat. Take care not to overcook the bok choy--the leaves should remain bright green and the stems should be crisp. 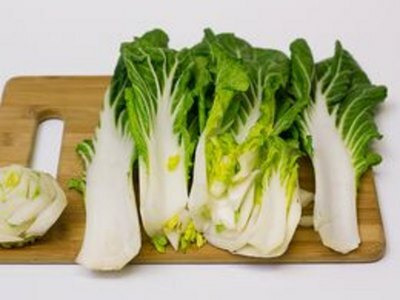 Sprinkle the bok choy with 1 tbsp. of soy sauce or toasted sesame oil and season with salt and pepper to taste. Bok choy will taste delicious with just light seasoning, but feel free to add additional seasonings if you prefer. 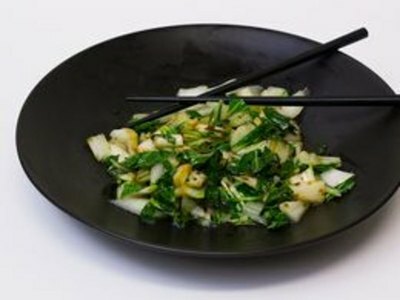 Roasted garlic, lemon juice, dried chili peppers and ginger go well with bok choy. As its name suggests, baby bok choy is smaller and is cooked a little differently. 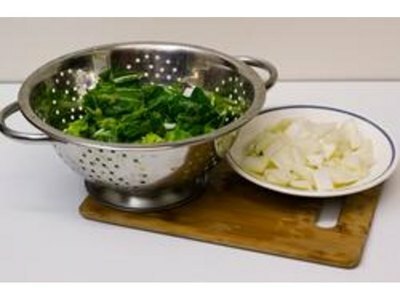 Remove the bottom of the baby bok choy; rinse and dry the leaves. 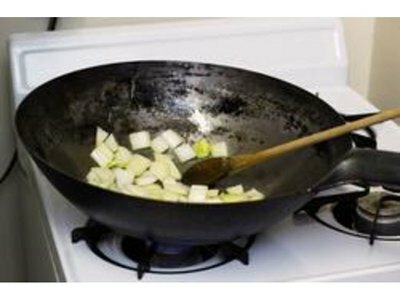 Follow Step 3 as written above, but add the entire intact leaf and stem into the skillet or wok and cook for two minutes. Add water, cover and steam for 30 to 45 seconds. Since baby bok choy is more tender than traditional bok choy, it cooks more quickly and does not need to be chopped prior to cooking.